Venice this summer, our winter, was perfect. Thanks to the GFC very few tourists made it and the intricate streets were relatively bare. But we did. 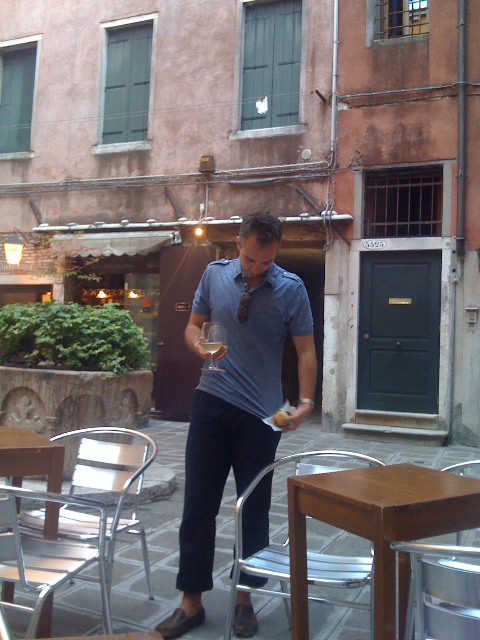 Favourite place was a little bar hidden away in some alley-wayward square, where we had truffled proscuitto rolls and glasses of Prosecco served in wine glasses. The city being virtually tourist-less made being able to find a table at the city's best seafood restaurant, where you sit under vines in a dappled little courtyard out the back of the restaurant, possible. On an antipasto plate, Venetians' favourite salted codfish (baccala) was piled on polenta squares, and spider crab (granseola) was served in its own shell, picked and cooked in in garlic, salt and pepper. Busara scampi (which is quite different to our local sort) is panfried in butter and sprinkled with chopped parsley. And the strangest thing I've ever eaten, squid eggs, are served poached and cut in half - the texture is between the white of a boiled egg and a heart of palm, the taste is subtly fishy and a little sweet. Here's a local recipe for spider crab with herbs and brandy (granseola alla buranella), but if you can't get spider crab then just use blue swimmer crab and serve in a little dish with crusty Italian bread on the side. This is a popular Venetian dish, and I got it from local restauranteur Luca Di Vita, who has an incredible restaurant where he serves it (Alle Testiere - Osteria con Cucina). 1. Bring a pot of water to the boil. Add salt and drop in the dead crabs (weighing about 700gms in total). 2. Drain the crabs and remove the legs and claws, break them open and cut the body in half. Pick the meat out of all sections and set aside. 3. Heat 3 Tbsp olive oil in a large pan. Add 3 cloves chopped garlic and cook for 2 minutes until golden. Add the crab meat, half a Tbsp each of fresh and chopped sage, rosemary, thyme and oregano, and 1 tsp hot chilli flakes. Season to taste and stir over a low heat for 2 minutes. 4. Drizzle 1 cup of brandy into pan and cook on a high heat until brandy evaporates, about 2 minutes, then serve with a crispy green salad and crusty bread.